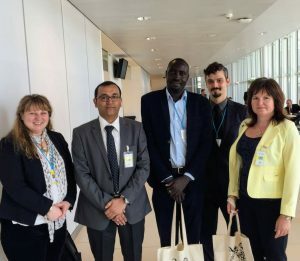 The sharp reality of combating organised wildlife crime networks was brought into focus at an event hosted by the Environmental Investigation Agency (EIA) on the sidelines of the 26th Session of the Commission on Crime Prevention and Criminal Justice (CCPCJ) in Vienna. Delegates attending the CCPCJ meeting heard from representatives of the law enforcement community from Asia, Africa and Europe who shared their experiences of battling high-level corruption and established transnational criminal networks responsible for the poaching and trafficking of tigers, elephants, rhinos, pangolins and other wildlife. 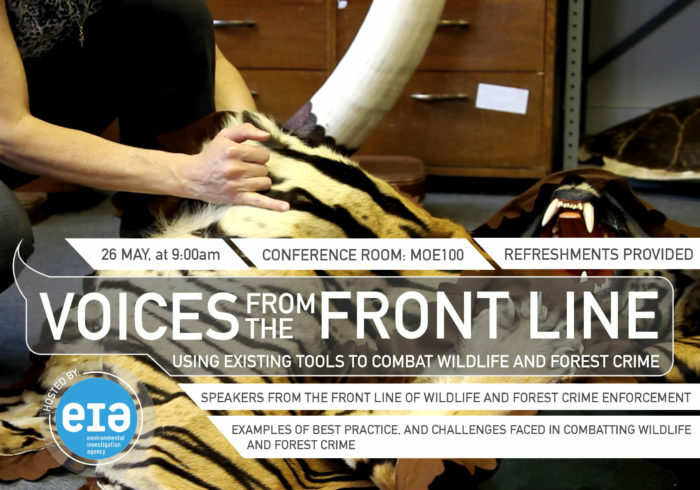 Hearing first-hand the experiences of those working to combat illegal wildlife trade struck a chord with the audience, hammering home the pervasiveness of the illegal wildlife trade and the risks faced every day by those charged with tackling the perpetrators of the trade. Mr Ritesh Sarothiya of the Indian Forest Service and head of the Madhya Pradesh State Special Task Force has been leading a long-term nationwide investigation into pangolin and tiger trade, with 129 arrests in just one network and the identification of several international connections. Ms Pavla Rihova is head of the CITES Department at Czech Republic Environmental Inspectorate and is leading major investigations into criminal syndicates responsible for trafficking rhino horn and tiger parts in and out of the country. Mr Vincent Opyene, former Head of Prosecutions for the Uganda Wildlife Authority and CEO and Founder of the Natural Resource Conservation Network, is leading a task force of specialised wildlife crime prosecutors working on ivory, pangolin and other wildlife trafficking cases, as part of public-private partnership with the Government of Uganda. crime is serious crime, at the field level efforts are still frustrated by a lack of interagency and international cooperation to disrupt these networks. Ritesh, Pavla and Vincent shared gritty, real life stories of bravery, ingenuity and tenacity to overcoming those challenges – wrestling corrupt police and military, launching dawn raids, undertaking forensic analysis, conducting crime scene management, meticulously gathering intelligence and preparing a case for prosecution, and reaching out to international counterparts for assistance – all the while withstanding threats to the security of their personnel. So much is at stake, not just the survival of endangered species but the lives of those on the frontline, good governance, rule of law and ultimately the sustainable development goals. With their fascinating tales from the frontline, we hope that delegates who attended the EIA event are inspired to ensure that commitments to effective enforcement and international cooperation are kept high on the international agenda … and that words are turned into real action on the ground.